Two of the most popular lean tools are standardized work and visual management. In most cases, these tools are talked about separately. These tools can be very powerful when they are combined at a leadership level. One group I have been working with wanted the supervisors of the area to get better at following standardized work. The department manager had seen the benefits of using visual management in other parts of his business and I had taken him on some tours showing how other companies use the tools in combination. With this in mind, the department manager tasked an employee to interview supervisors in the area as well as other areas to determine the tasks they need to do on a daily basis then develop a visual way of displaying the standardized work. This is the result of the work. The tasks are listed down the left hand side. The days of the week across the top. Under each day of the week, is each supervisor’s name by shift. When the task is completed the supervisor checks it off. At the bottom the department manager has a daily task to audit the standard work for the supervisors to be sure they are not just pencil-whipping the board. What the department discovered were a lot of unintended benefits. One of the biggest was the operators holding their supervisors accountable for doing their standard work. The operators would challenge the supervisors about filling out the production paperwork as well as other tasks that weren’t running the line. The operators would say they were too busy and if the supervisor said it needed to be done, the operator would counter with then why haven’t you done your standard work. You can’t hold me accountable for something you won’t do yourself type of comments. From that moment on the supervisors have stuck to their standard work. Now the supervisors are leading by example which makes the operators want to follow them. Now to the next level. When talking with the department manager, he mentioned the tasks are pretty much listed in the order they need to be completed. I asked how they could make it visual as to when the tasks should be completed? How can they make it visual to show what tasks are OK to miss if the supervisor is out of the plant or in a kaizen event for the day? What tasks can’t be missed and their needs to be a backup plan if the supervisor is out? The board is great. It has produced some great results for the team. I hope it is an example that others can learn from….inside the facility as well as outside the facility. Posted on June 3, 2011, in Engagment, Standardized Work, Tools and tagged Engagement, Standardized Work, Tools, Visual Managment. Bookmark the permalink. 12 Comments. That’s a great board for the daily tasks. Do they have a board for a daily operational review? They do not review production on daily. 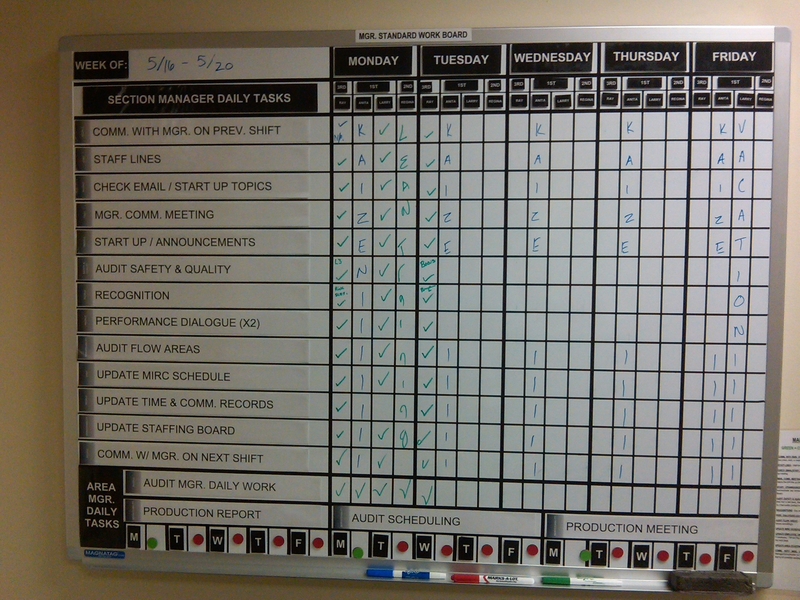 Most production lines do have a board they put daily production on but it is not reviewed on a daily basis. They review weekly. Who does the weekly review? The supervisor does the weekly review with the operators during one of their start up meetings. Good to see this topic being discussed more broadly. It is always challenging to have management understand that the same types of standards they apply to the shopfloor also need to apply to them. Leader Standard Work can be a great methodology. However, it has to be done work. It’s more than creating checklists. Even when done right, it takes at least a month to get used to and not everyone has that patience. If you get it wrong, it will take longer. This is a great article on Industry Week. Thanks for sharing. Can this LSW apply to refinery shift work? Can this LSW apply to Refinery and Chemical Plants shift production supervisors?